What better way to relax after a brain-smashing day at the coal face than by jamming some equally brain-smashing technical death metal. This is the latest full-length from Southern England's Bloodshot Dawn, which was released by UK label Hostile Media in mid-January. This is Bloodshot Dawn's third full-length and it's been three-and-a-half years in the making. They're really starting to gain proper momentum and after celebrating their 15th anniversary during their recent UK tour, they're due to tour Canada in April and Japan in the near future. Bloodshot Dawn’s transition from a straight-up groove laden death metal band to the technical beast you hear before you has been impressive. On “Reanimation” they really nail it and it all begins with Seared Earth. Blistering drumming is met by thunderous bass, futuristic leads and harsh growls to produce a death metal album full of real quality. These first four or so minutes set the tone for something incredible. 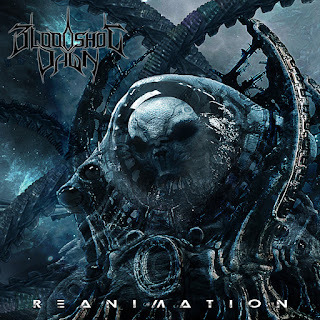 Their sound is full of modern touches, what with the subtle electronics that sit beneath the heaviness and the production that brings everything together on Graviton Nightmare, yet both the song and Bloodshot Dawn themselves sound very much rooted in the genre. What is surprising though is just how much straight-forward metal influences this record. Survival Evolved features some super catchy lead-work and it’s matched by the song-writing too. They include some thrash-like rhythms in Upon The Throne Of Fear and the duelling guitars take things one step further. The bass riffs that bolster Controlled Conscious are great and the further you get into “Reanimation”, the more you’ll find yourself grinning and headbanging with abandon. It’s just ridiculously listenable and for a death metal album, that’s not an easy task for a band to pull off. You might feel a slight sense of nostalgia when listening to the verses of Soul Affliction, because it definitely leans more towards the groovier end of the spectrum, albeit without losing all of BD’s progressive nous. There’s still no escaping the futuristic nature of Bloodshot Dawn on “Reanimation” and it’s more than obvious on Shackled. I don’t honestly think that you’ll find a better band than them playing technical death metal at the moment. Battle For The Omniverse has a tempo that’s unrelenting and it rages the hardest of any song on “Reanimation”. The bluesy/experimental solo that bridges the first and the second halves of this six-minute monster must be heard to be believed and the progression carries on through the rest of the song, which makes for a jaw-dropping few minutes. DNA Reacquisition is a great title for this penultimate instrumental, as that’s pretty much what it does to you. After getting this far you’re brain will have been reprogrammed to the ways of Bloodshot Dawn and there will be no turning back from here. It’s left to Reanimated to finish the job and it does so in glorious fashion. Damn this album is so good. The fact that we have this talent on our shores is incredible and I think that this year will be Bloodshot Dawn’s for the taking.